How to put chords to a bassline? Say I have come up with a riff and I want a keyboard or guitar player to flesh it out..
How do you know what's going to be right for a tune? if you know the chords to a song you can figure out which key the song is in. you can play all the notes from that key and it will sound ok, you just need to experiment the different notes from this key to figure out different feelings and emotions that you can evoke with them. I think I explained this in another post, i'll try to find it. 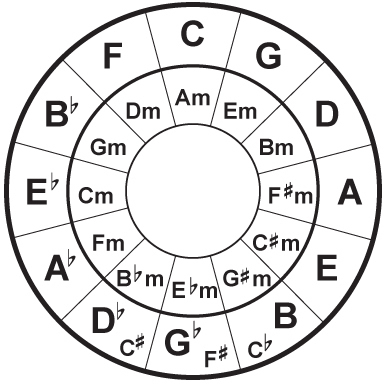 http://www.bigbasstabs.com/thread/3151.html - and here I explained the circle of fifths which should help you figure out which scale you're in, depending on the chords. so it's the other way around - figuring out a chord progression from a bassline. find out what key your bassline is in - find out which sharps and flats you use and find out that key in the circle of fifths. you can use all the chords that are adjacent to the key that your bassline is in. in your example you have C and E. this notes are present in any number of scales but the most simple one here is C major (C D E F G A B ). So looking at the circle of fifths, the chords that go well into the C major scale are C-major, F-major, G-major, D-minor, A-minor, E-minor. You need to experiment what feeling and emotions you will evoke with these chords. The easiest way is to start the progression on the same chord as the key (C-major). then just try which ones build up tension and release it. Experiment. C and E are also present in the G-Major scale (G, A, B, C, D, E, and F#) so you could very well use the chords: C,G,D,Am,Em,Bm. Depending on how you use these chords the mood is gonna be a bit different than the one used in C-major especially as the melody starts on the C.
Let me start out by saying that you can do anything you want with those 2 chords. the C to Eb bass movement implies a couple of keys. The two keys that come to mind (that would be the most practicle) are Eb major and Bb major. What's great about scales is that every note in the scale can be a chord in a key center. if you want to expand on that bassline with other chords, you can use these other 5 chords. If you compare the two keys, you'll notice that C is still minor and Eb is still Major. However, now the C is the 2 chord and Eb is the 4 chord. This gives them a different function because now that kay center has changed, they play a different role. what's really cool is the fact that you can use all of these chords in the song. if you find ways too merge the two keys, you can get some really cool changes happening. it still has movement to it. oh yeah it was C and Eb (not C and E as I mistakenly wrote) makes my post a bit more invalid. thanks for this writeup just3boyz! no problem johnny! what you posted is good stuff too. just wanted to be more specific too his example. purplez, if you don't know how to play these chords as arpeggios just go under the bass lessons tabs and look up each chord.